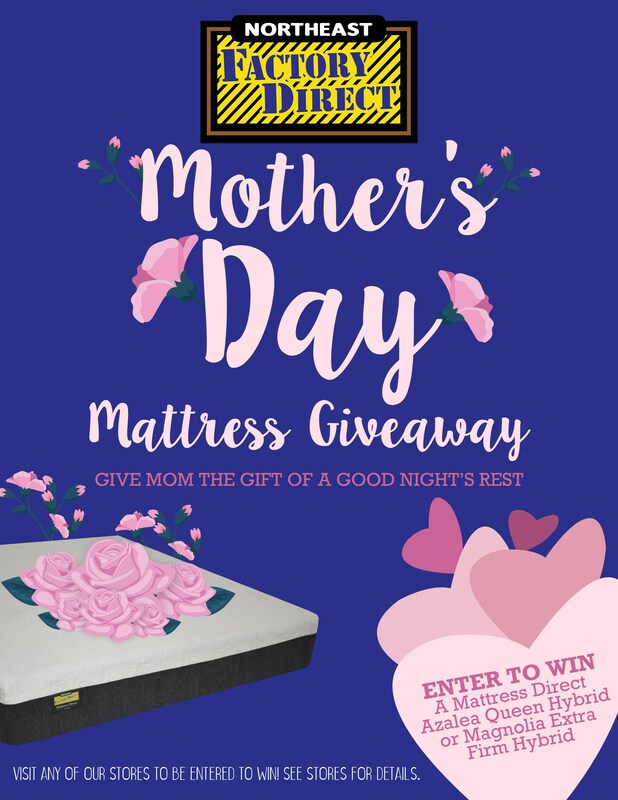 Northeast Factory Direct 2019 Mothers Day Mattress Giveaway! One lucky winner per location. No purchase necessary. Purchase a mattress between April 1st and May 5th and receive one extra entry into the contest! Winner will receive a Queen Magnolia or Queen Azalea Mattress Direct mattress! If you purchase a mattress between April 1st and May 5th and are the lucky winner you will be reimbursed up to $799 of your original mattress purchase price. (Prize is for mattress only. Foundation and delivery is not included in this promotional price) Winners will be contacted Sunday May 12th on Mothers Day! Entries must be completed in stores. One entry per person. You will receive one additional entry with the purchase of a mattress. Entries must be completed in its entirety or it will be discarded. Please visit one of our three locations to enter the contest. * We would also like to send a very special thank you to our friends at Mattress Direct! Come check out our exciting new line of Mattress Direct Mattresses!